Nurses, more then most people, are more educated about the benefits of graduated compression…meaning there is a greatest amount of compression in the ankle and less in the calf, to open up the blood vessels to enhance good circulation. On a daily routine day, nurses apply a low to moderate compression T.E.D. stockings on their patients, which are designed for immobilized patients that need only light moderate compression, while lying in the hospital bed for several days. 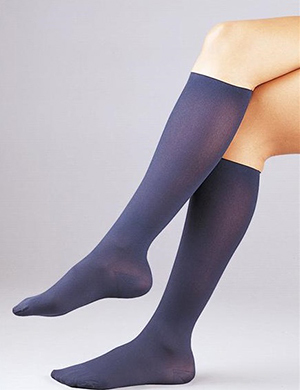 Anyone who works on their feet all day can benefit from wearing compression stockings or socks. You may ask: what compression levels is best recommend to start out with? It’s according to your family history of varicose veins and if you are more prone to develop them and other venous problems. If this is the case, you may want to start with a higher compression level. Click here to see a general guideline for the different compression levels perscribed by vascular doctors. Below is just a few selections that help with Blood Circulation in the legs. Start TODAY, while your young, SAVE your LEGS!! Keep your legs feeling fresh and energized during those long 12-Hour shifts. I want to a send a huge "SHOUT OUT" of appreciation, to all our nurses that we depend on each and everyday for their dedicated long hours of healthcare service they extend to us. Thank You!! !